Known historically as ‘The Cape of Storms’ the tempestuous seas around the Cape Peninsula have battered the rocky shores, and more than a few ships, for millennia. The peninsula juts out into the ocean at the edge of the African continent, tipped by the Cape of Good Hope (which, contrary to popular myth, is not the southernmost tip of Africa – this honour is reserved for Cape L’agulhas, a little further east). With the icy waters of the Atlantic Ocean on one shore, and the warmer waters of the Indian Ocean on the other, Cape Town has historically served as a watering hole for travellers, and continues to do so today, although as a destination rather than a stopover on the Spice Route to and from Asia. Cape Town’s seas are a wealth of marine lifes, reefs and tumultuous waves swept by South Easterly Trade winds and nurtured by the icy Benguela current that gives rise to one of the most dense, ecologically diverse and complex marine environments in the world. Its waters are home to countless underwater sea creatures, whilst its surface is a playground for those who love to surf, sea kayak, dive, snorkel and scuba dive. The thought of a close encounter with a great white shark is not everyone’s cup of tea. The chances of such an encounter whilst surfing, diving or swimming are low. Yet visitors to our shores willingly seek them out. 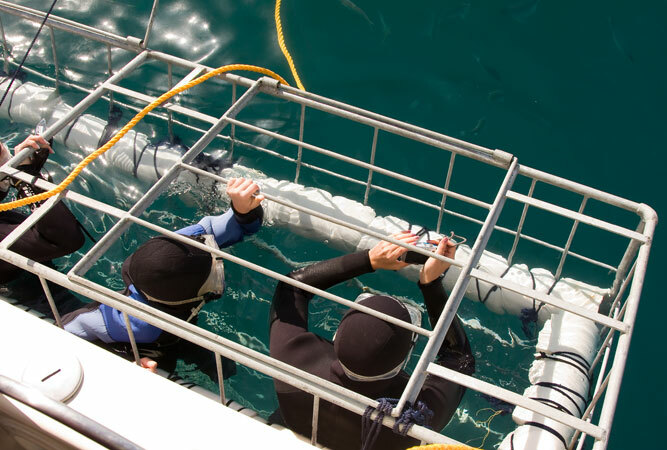 For those for whom the prospect of heading beneath the waters into shark territory is an immediate adrenaline rush there are a variety of tour operators and professionals who offer shark cage diving. The coastline off Gansbaai, a couple of hour’s drive from Cape Town, is the shark capital of the Cape, although one can also shark cage dive close to Simon’s Town. This attraction is available all year round, although some advocate winter as the better season to spot sharks. If neither Gansbaai nor Simon’s Town appeals, then the Two Oceans Aquarium offers shark diving in the predator exhibit. You should be a competent swimmer if you want to swim with seals, but you won’t need any snorkelling experience, or wetsuit and goggles, because the outing includes background on the Cape Seals, a dive guide, and all the equipment. This is a less dangerous, and arguably more beautiful (I’m a fan of Cape fur seals), activity than shark cage diving, although no less active. 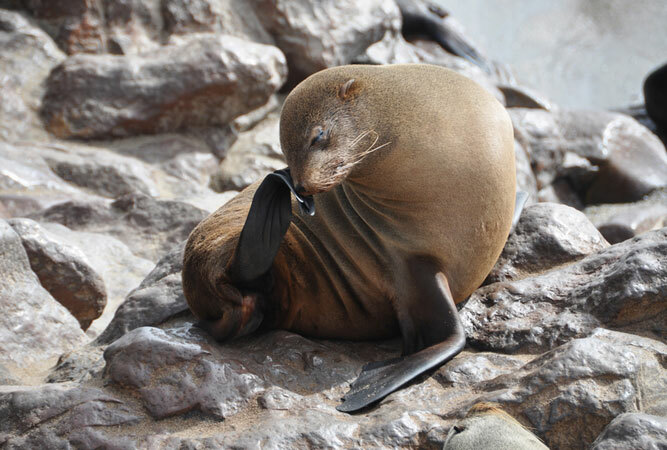 Just off the waters of Hout Bay, on Duiker Island, lives a large colony of Cape Fur seals. The water is icy – good to know, as there are no sharks for that very reason – but you are swathed in a 5 mm wetsuit that helps insulate you from the cold. The seals are curious, playful and gentle (although they may give you the odd bump or nudge; you are in their space, after all). Do this activity all year round, in groups of about 12 people. 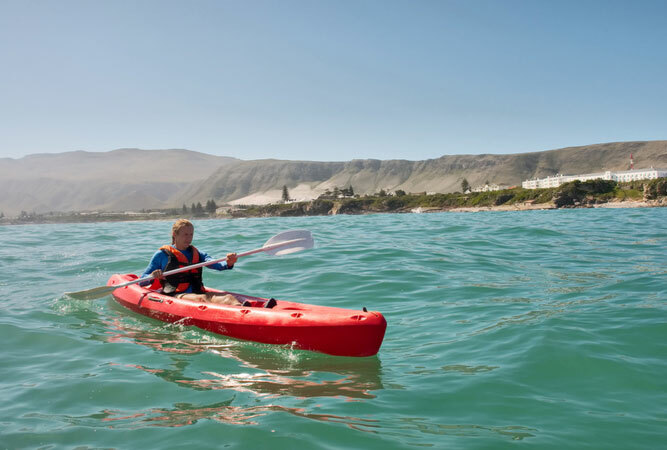 Thousands of visitors head annually to the shores of Hermanus for some of the world’s best land-based whale watching, and there are boats that venture out to sight the Southern Right Whale as well. But to kayak so close (within 300 metres) that you can hear a whale surface is an impressive undertaking, one that allows little to come between you and the eighteen metre long whale. The chance to encounter whales, as well as dolphins, penguins, cormorants and Cape fur seals, is possible in Cape Town at Cape Point, the Atlantic Seaboard departing at Three Anchor Bay, Hout Bay, and Simon’s Town. For something really different opt for a full moon paddle (April through October) in False Bay. This happens only once a month, when the weather and a moon rise coincide with sunset, from Simon’s Town. Cape Town hosts its own penguin colony at Boulders Beach (called such because of the giant boulders on the beach) just outside Simon’s Town. 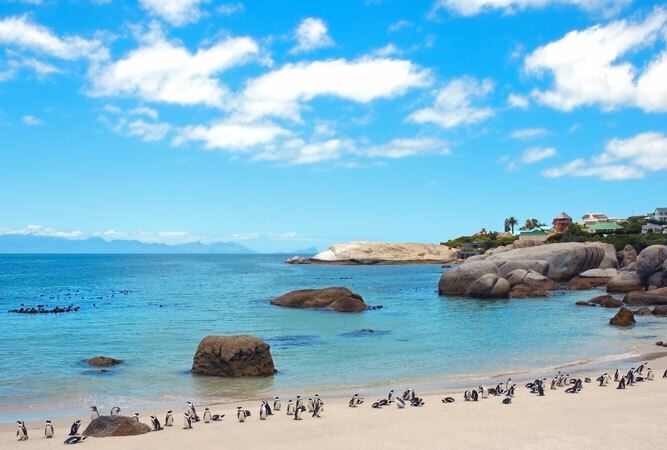 If you can find parking (during summer and particularly during the festive season parking is at a premium) the sheltered beach offers you a chance to sit in amongst, and swim with, penguins. The African penguin has set up home everywhere – under bushes, on the boardwalk, around the side of boulders – but they’re adept at ignoring humans so don’t expect to touch or enjoy a one-on-one with them. Cape Town’s coastline is rich with kelp forests, coral gardens and reefs. The Benguela current brings with it a wealth of micro-organisms that attract fish, seals and other larger animals that feed off the smaller animals. As a result, the seas of the Cape are rich with marine life. Reefs are best dived between March and September in 7 mm, two-piece wetsuits. And you may need a torch for the deeper waters. For those who would rather stay safely above the water level, the coastline is rich with rock pools, particularly the more rocky, less frequented beaches like St James, Seaforth, and Water’s Edge. Wall sponges, sea fans, perlemoen, sea urchins, spider crabs, starfish, sea cucumbers, anemones and feather stars provide hours of seaside pleasure.